Hush is a 2016 American slasher film directed and edited by Mike Flanagan, starring Kate Siegel, who also co-wrote the film with Flanagan. The film co-stars John Gallagher Jr., Michael Trucco, Samantha Sloyan, and Emilia "Emma" Graves. It was jointly produced by Trevor Macy through Intrepid Pictures and Jason Blum through Blumhouse Productions. The film had its world premiere at South by Southwest on March 12, 2016, and was released by Netflix on April 8, 2016. Madison "Maddie" Young is a deaf-mute woman who temporarily lost her ability to hear and speak after a bout of bacterial meningitis at the age of 13 and lost both permanently after a corrective surgery gone wrong. She lives in a house, isolated in the woods with her cat. Her friend and neighbor Sarah visits her one day to return a copy of her book. In discussing Maddie's writing, she describes with excitement how her stories play out in her head like a film and she can see all the possible endings. That night, a masked killer chases Sarah to Maddie's house. A bloodied Sarah bangs on the door begging and shouting for help, but Maddie cannot hear her, and the man stabs her to death. The man quickly learns of Maddie's infirmity and sneaks into the house through the main door, steals her phone, takes photos of her and sends them to her. Realizing this, she locks herself inside the house. The man cuts the power and sabotages her car. Maddie writes on the glass-paneled front door "won't tell, didn't see face, boyfriend coming home" with her lipstick. However, the man responds by taking off his mask and showing off his face. Maddie unsuccessfully tries to distract him with her car alarm to get Sarah's phone from her body, but she manages to stab his arm with a hammer's claw. He mocks Maddie, revealing he has the phone as well. He takes one of Sarah’s earrings out and puts it in his pocket. She makes several failed attempts to escape through the window and ends up climbing onto the roof. The man fires a crossbow bolt and hits her leg, but she manages to knock him off the roof and grab his crossbow. She staggers back into the house, removing the bolt from her leg before trying to reload the crossbow. John, Sarah's boyfriend, arrives and looks for Sarah. The man meets John, pretending to be a police officer responding to a call, and delivers a false story of how he was rendered unconscious by an intruder. He asks for John's phone, faking a call for police backup. He attempts to pocket John's phone but when John asks for his phone back, the man inadvertently pulls out Sarah’s earring from his pocket, and John sees it drop. Suspicious, John points out the flaws in the story, stating that Maddie is deaf and mute and therefore unable to make a call. He tries to distract the attacker by telling him he thinks Maddie keeps a spare key in a planter and grabbing a rock, he is ready to attack the man when Maddie bangs on the windows and pulls his attention away. When John turns, the man stabs him in the neck. As John bleeds out, he uses his remaining strength to put the man in a chokehold, mouthing "run" to Maddie. Maddie attempts to run but is caught and bludgeoned to death with a rock, before it is revealed that this is an ending playing out in her head, the way her stories do. She realised that any attempt to hide or escape will result in her bleeding out or getting caught, so she decides her only option is to take the man off guard and kill him. The man threatens Maddie's cat with a knife, but she fires a bolt from the porch, hitting him in the shoulder. While running back inside, she drops the remaining bolt. When she attempts to grab it, the man slams the sliding door shut on her wrist, then he crushes her hand with his boot letting her go inside with broken hand and fingers. Continuing to play his game of cat and mouse, the man allows Maddie to close and lock the door. He threatens to enter the house, to which Maddie writes "do it, coward" on the door with her own blood coming from her leg injury. While the man begins bashing the glass with a tire iron, Maddie thinking she may end up dying, quickly types a description of the man, a message to her family, and "died fighting" on her laptop before running to the bathroom with a knife, waiting for the man to enter. Having difficulty breaking in through the front door, he crashes through the skylight into the bathroom, unbeknownst to Maddie. The man's breathing inadvertently alerts Maddie, who narrowly avoids his attack and stabs him in the knee. She stumbles into the kitchen, her vision beginning to blur. When approached in the kitchen, thinking that she’s unconscious, she sprays the man's eyes with insecticide and disorients him with her visual smoke alarm. However, the man overpowers her, throwing her down and strangling her. On the verge of death, Maddie's life flashes before her eyes, and in a last ditch effort she grabs a corkscrew within arm's reach and plunges it into his throat, finally killing him. Maddie retrieves her cellphone from the man and dials 911 before stumbling outside and sitting on the porch. Maddie's cat sits next to her, rubbing against her leg. As the police near her house, Maddie closes her eyes, pets her cat, and smiles. Nothing was known about the project until September 2015, when it was revealed at a buyers' screening which occurred at the 2015 Toronto International Film Festival. It was revealed Mike Flanagan had directed and written the film, along with his wife Kate Siegel who also stars in it. On making the main character a deaf mute, Flanagan had said it originated from him wanting to do a movie "without dialogue". The possibility of making the film entirely silent was briefly considered, but was soon abandoned when it was realized that building tension with this limitation would be "impossible"  Flanagan also noted that the target audience would not have been used to silent films and, as such, would "seek out every kind of audio stimulus anywhere else in the environment" or simply choose to not watch the film at all. The script itself consisted largely of scene directions, which Flanagan and Siegel developed by acting out in their own house. The fact that so much of the script was based around Flanagan and Siegel's own house proved problematic for filming, as when they went to shoot the film in Alabama, they could not find a house similar enough to theirs and had to significantly alter the film's script. Flanagan also found challenges in the single location and had to plan the cinematography to keep the film interesting to the audience, especially given the mute nature of the protagonist; to this end, Flanagan used a Steadicam to follow Siegel's every move, along with a boom mic and a spotter, to make the movement more "dynamic". The resulting audio for these scenes could not be used and had to be redone in post, with Flanagan noting that the audio initially "sounded like a herd of elephants." To represent Maddie's world, various ambient sounds were used, such as the sound of ultrasound machines. Flanagan did not want to use pure silence for these scenes, as he still felt it would make viewers even more aware of their surrounding and take them out of the experience. As a result of the aforementioned camera set in, Siegel had to ADR her own breath into the final film. The film's soundtrack was composed by The Newton Brothers. The film had its world premiere at South by Southwest on March 12, 2016. Prior to the premiere, Netflix acquired worldwide distribution rights to the film, which it released on April 8. According to the review aggregator website Rotten Tomatoes, 92% of critics have given the film a positive review based on 24 reviews, with an average rating of 7.6/10. At Metacritic, which assigns and normalizes scores of critic reviews, the film has a weighted average score of 67 out of 100 based on reviews from 7 critics, indicating "generally favorable reviews". Benjamin Lee of The Guardian said that Hush "offers ingenious suspense" and awarded it four out of five stars. Geoff Burkshire of Variety, though criticizing the film's third act, called it "one of the more inspired concoctions to emerge from the busy Blumhouse horror-thriller assembly line in recent years." Michael Gingold of Fangoria gave the film 3.5/4 stars, calling it "a good old-fashioned truly scary movie". 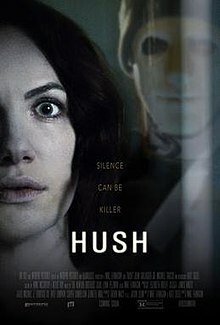 Jasef Wisener of TVOvermind gave the film a 4.7/5, noting that "Thanks to the performances from its two leads, Hush succeeds in almost every aspect and delivers one of the best horror films in modern history." Richard Newby of the website Audiences Everywhere called the film "a modern slasher movie classic that's not to be missed." Stephen King wrote about the film on April 20, 2016, saying, "How good is Hush? Up there with Halloween and, even more, Wait Until Dark. White knuckle time. On Netflix." Filmmaker William Friedkin, director of The Exorcist, also commented on the film, saying "HUSH is a great horror film...on Netflix. Terrifying." ^ "Hush (2016)". AllMovie. Retrieved June 28, 2017. ^ Mike Flanagan [@flanaganfilm] (26 October 2016). "@BlakeZ43 Alas Hush was 1 mil; Absentia was 70k. Got mixed up in a few articles. But glad you dig it!" (Tweet) – via Twitter. ^ "Hush (2016)". IMDb. 8 April 2016. Retrieved 11 April 2016. ^ a b "Hush". SXSW.com. Retrieved March 11, 2016. ^ McNary, Dave (March 10, 2016). "Netflix Buys Mike Flanagan's Horror-Thriller 'Hush' Ahead of SXSW Premiere". Variety. Retrieved March 11, 2016. ^ Fleming Jr, Mike (September 11, 2015). "Hush' Buyer Screening Leaves Buyers Buzzing: Toronto". Deadline Hollywood. Retrieved March 11, 2016. ^ Mack, Andrew (September 12, 2015). "Toronto 2015: Mike Flanagan's 'Secret Project' HUSH Creates Buzz At Buyers Screening". TwitchFilm.com. Retrieved March 11, 2016. ^ a b c Thurman, Trace. "[Interview] 'Hush' Director Mike Flanagan and Actress Kate Siegel On Their New Thriller!". Bloody Disgusting. Retrieved 8 June 2016. ^ Peitzman, Lous. "Meet The Filmmaker Who Wants To Save Horror From Jump Scares". Buzzfeed. Retrieved 8 June 2016. ^ a b c d e Gingold, Michael. "Q&A: "HUSH" Director Mike Flanagan on the Scary Sounds of Silence". Fangoria. Retrieved 8 June 2016. ^ "The Newton Brothers scoring Mike Flanagan's "Hush"". FilmMusicReporter.com. October 18, 2015. Retrieved March 11, 2016. ^ McNary, Dave (March 11, 2016). "SXSW Unveils Lineup With James Caan, Ethan Hawke, Keegan-Michael Key Movies". Variety. ^ Hipes, Patrick (March 10, 2016). "Netflix Acquires Micro-Budget Horror Pic 'Hush', Latest From Blumhouse & Intrepid". Deadline Hollywood. Retrieved March 11, 2016. ^ Erbland, Kate (10 March 2016). "Netflix Buys Mike Flanagan's 'Hush' Before SXSW World Premiere". ^ "Hush (2016)". Rotten Tomatoes. Fandango. Retrieved April 14, 2019. ^ "Hush (2016) Reviews". Metacritic. CBS Interactive. Retrieved April 16, 2016. ^ Lee, Benjamin (April 14, 2016). "Hush review – nifty home invasion thriller offers ingenious suspense". The Guardian. Retrieved 2016-04-26. ^ Burkshire, Geoff (March 13, 2016). "SXSW Film Review: 'Hush'". Variety. Retrieved March 13, 2016. ^ Gingold, Michael (March 13, 2016). ""HUSH" (2016; SXSW Movie Review)". Fangoria. Retrieved March 13, 2016. ^ Wisener, Jasef (April 9, 2016). "'Hush' (2016) Film Review". TVOvermind. Retrieved June 13, 2016. ^ Newby, Richard (April 12, 2016). "Hush is Brutal and Nuanced". audienceseverywhere.net. Retrieved April 12, 2016. ^ "Stephen King Gets Loud About HUSH". Dread Central. Retrieved April 21, 2016. ^ @WilliamFriedkin (5 December 2016). ""HUSH is a great horror film...on Netflix. Terrifying."" (Tweet) – via Twitter.